Free Electronic Cigarette!! ~ Like FIN on Facebook for your chance to get one!! I have teamed up with the Charisma Media Network to bring you a soup-tastic giveaway sponsored by Kettle Cuisine. Kettle Cuisine offers chef inspired soups that are frozen in individual bowls for your convenience. Kettle Cuisine offers gluten free, all natural soups that taste every bit as good as they look! The assortment of varieties is impressive, as is the taste! Look for Kettle Cuisine Soups at a grocer near you in the natural foods frozen section. To find a retailer near you that carries Kettle Cuisine Soup check out the Kettle Cuisine website! 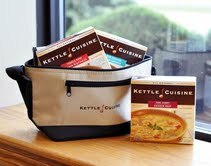 Kettle Cuisine has generously offered to give 10 lucky readers a fantastic prize pack! Each prize pack contains a cooler lunch bag with 3 coupons for a free Kettle Cuisine product, an informational brochure and a notepad! Please enter to win via the rafflecopter form below! Did you know the Charisma Media Network is seeking bloggers? Visit www.charismamedianetwork.com for more information! *The participating bloggers cannot be held responsible for the shipment of the prize, as this is the responsibility of the sponsor, Kettle Cuisine. The Thai Curry sounds good. Chicken Chili with White Beans!! YUMMY! Clammy Chow’da, and a bag is always nice! Three bean chili sounds amazing! I would devour it! I want to try the Angus beef steak with Chili! I love both. I can always use something to keep the soup warm while transporting it. Taking soup to the beach, or a graduation, etc, would be a nice change. Three Bean Chili sounds awesome ! I would love to try the Southwestern Corn chowder one. YUM! I love cooler bags and soup! With all the kids I have we always need to tote something to eat or drink around for soccer, the beach or just a trip to the playground. We all love chicken soup too.